This smoothie is my best healthy approximation of that naughty fast-food frozen dessert. Taking unhealthy foods and making them healthy is what I’m all about. This is a fairly basic and easy to make smoothie as long as you have cacao powder on hand. I provided plenty of add-on suggestions to take this smoothie to the next level of healthiness. Quick smoothie health info – cacao is a superfood especially high in magnesium and vitamin C. It’s known to aid brain health, boost your mood, improve vision, improve blood flow, prevent cancer, and help maintain healthy cholesterol levels. For the full download on this awesome superfood, see my article What is Cacao and why is it perfect for Smoothies? Next time your kids ask for a fast-food shake, whip up this smoothie and feel good about feeding them something healthy. Might want to add additional sweetener to satisfy some kids. Enjoy! 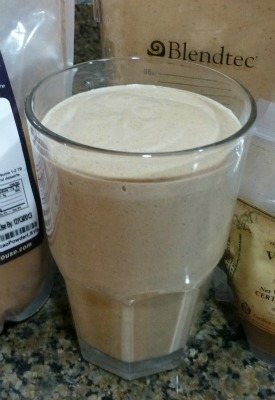 I’d love to know if you tried this chocolate frosty smoothie and if you think it compares to the original – please do tell in the comments below. Happy Blending! Yum! I’ve made this a few times now. Didn’t like the texture with almond milk – it was just all right as a smoothie, but not exciting and definitely nothing like a Frosty. This last batch was THE BEST so I wanted to tell you about it. I used moo-milk, 2% because that’s what I prefer. Like virtually every smoothie I make it got a scoop of protein powder – Warrior Blend Chocolate this time. I found the banana taste a little intrusive so I doubled the choccy (didn’t have cacao on hand so organic cocoa powder), added a sprinkle of Sucanat because a Frosty is VERY sweet and I did not want the maple or honey flavor or stevia aftertaste, a very small pinch of sea salt, and 1 tsp coconut oil (more was greasy-tasting, and with EVCO the coconut flavor was intrusive). It aerated a great deal just with my super-cheap blender even before I added the 3 cubes of ice, very fluffy with undetectable bubbles, almost meringue-like; ended up with a HUGE smoothie, about 30oz, so I only had about 1c because it was surprisingly filling, and popped about 2/3 in the freezer for later. It was the most Frosty-like of all my attempts, including less-healthy recipes with junk like pudding mix in them. Now comes the cool thing. After about 2 hours in the freezer I pulled it out to check on it and it had frozen about 1/4 of the way in from the edges, so I scraped the frozen stuff off the edges with a fork, stirred it up thoroughly and NOW it was REALLY like a Frosty or soft-serve, and I ate about 1c, about the same as a kid-size Frosty. But, I wanted to experiment so I put the remaining ~1.5c back into the freezer and did the stir-up twice more, 2 hours apart. Result: some very tasty, pretty healthy, somewhat scoop-able ice cream! Admittedly, a little bit coarse in texture due to the primitive freezing method. If I get my hands on an ice cream maker that doesn’t involve messy salt and ice, I will try that method and report back. I think it would have made 3 generous and filling servings of ice cream – and at (approx., using the Sparkpeople calculator) 130 calories, 4g fat, 9g protein, 8g net carb, 2.5g fiber each, that’s not too shabby. Wow, thanks for the detailed account of your smoothie making experiments. I actually use raw milk (goat and cow) quite a bit, which I find results in a smoother, more appealing texture. If you can get your hands on raw milk I recommend you give it whirl. Raw milk kefir is also excellent. I hear you on mimicking the extra sweet frosty taste. Sucanat is a great alternative sweetener. Hi Vivienne, try using a little less milk and a little more frozen banana and ice. You could also try freezing for a while like Mary. Cheers! and forgo the vanilla extract and ice cubes! The almond butter delivers the goods on this one! Always nice to hear from a fellow IIN alum :) It appears I never replied to Sam’s comment and to my own detriment because I haven’t tried this smoothie with almond butter. I’ll have to grab some on my next co-op trip and give it a blend. Fellow chocoholic here too :) You can’t beat the creamy consistency (and healthy fats) from avocado. Thanks for the kinds words. I also add a couple of pitted dates to sweeten this smoothie. I have made it several times and I also add a few more ice cubes to make it frosty and thick. not that it was bad or anything, but its just misleading if people expect a frosty. i think this would be better if i had used regular cows milk instead of almond milk… just a heads up to the others! I made this smoothie exactly as it’s written. It has a disgusting aftertaste. Does anyone else have that problem, or know how to fix that? Thanks. Sorry to hear you didn’t find this smoothie very tasty. Maybe the banana wasn’t ripe? I’d make sure to use a ripe banana and enough sweetener if you try it again. Noelle I made it for the first time today and I completely agree. I thought maybe my banana was not quite right. I added mint powder and followed the basic recipe exactly. It was inedible. I am trying to figure out what did not work for me because I would love to make a healthy shake the it reminiscent of a frosty. I wonder if it was the raw cacao powder – musty and earthy tasting is a great way to describe what this tasted like. Thanks Mary! !